Couscous [koos-koos] is generally known as a grain, but it's more closely related to a pasta. It's been served as a staple in many dishes in Northern African and Mediterranean cuisine for centuries. Couscous is prepared from the grain by sprinkling the semolina with salted water and rolling it into shape. The exact origin of the name "couscous" is unclear, but many agree that it derives from the Arabic Berber dialict of "kiskis", referring to the steaming vessel in which couscous is prepared. Traditionally, couscous is cooked by several steamings over a fragrant broth- between one and three times depending on regional customs. 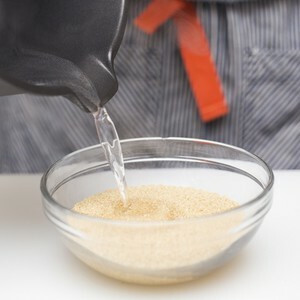 Modern couscous, especially couscous sold in the U.S., is typically steamed before it is packaged so home cooks need only drop the couscous in boiling water or broth. Single grains of whole wheat couscous are quite small, usually only slightly larger than coarse-ground grits. Whole wheat couscous is high in fiber and protein. Like many pastas and grains, couscous is fairly flavor-neutral. It's highly adaptable to a number of dishes ranging from savory to sweet. Couscous pair best with bold-flavored, in-season vegetables.